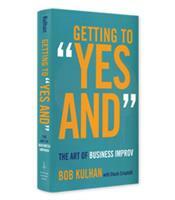 Speed Review: Getting to "Yes And"
Veteran improv performer, university professor, CEO, and consultant Bob Kulhan unpacks the mental agility and power of improvisation. Kulhan shows how improv techniques such as the "Yes, and" approach, divergent and convergent thinking, and focusing on being present can translate into more productive meetings, swifter decisions, stronger collaboration, mindfulness, and more. The Osama Bin Laden raid may seem a surprising choice as the first case study to appear in a book written by a veteran stage performer and alumni of the famed improvisational troupe Second City. The story underscores, however, Kulhan’s point that the techniques of improvisation are valuable and important in any domain. As for business, Kulhan writes, “the same skills that make for exceptional comedic improvisation — intense listening, focus, energy, engagement, teamwork, authenticity, adaptability — are skills that any businessperson can use to make positive changes in the workplace.” Improvisation, Kulhan argues persuasively, is clearly not just “making stuff up” to be funny. 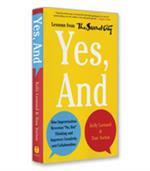 Getting to “Yes And” explores how to apply improvisational skills to the business arena. In detailed and grounded chapters, Kulhan shows how improvisation can be applied to personal development, communication, team building, leadership and changing a corporate culture. Kulhan emphasizes that the point of improvisation is not for everyone to get along. It is for everyone to work together toward a common goal and without a personal agenda. Kulhan is President, CEO and founder of Business Improv®, a consultancy specialized in experiential learning that works with major international companies, as well as Adjunct Professor at Duke University’s Fuqua School of Business and Columbia Business School. While Kulhan may also be an actor, Getting to “Yes And” is an eye-opening and innovative business book written by a business person and professor for business people.